Most people believe that almond milk has not been around for long. This couldn’t be further from the truth! The history of almond milk goes back to the Arabs and the Persians. It was later adopted by the medieval Europeans. It was widely used in cooking, in desserts and as a refreshing beverage. One August several years ago whilst in the south of Italy during almond harvest season, we had the most delicious fresh almond granita with simple syrup and crushed ice. What a thirst quenching drink it was! My son became addicted to this delicious drink (he tends to suffer from short term addictions to foods from our travels) and upon my return to Dubai, I was obliged to prepare this drink for him until he got it out of his system. WOW, how easy it was to make!  Almonds are high in iron and antioxidant vitamin E which is great for the skin.  It is lactose free, so goodbye to bloating and stomach cramps.  It is cholesterol free.  It has much fewer calories than cow’s milk.  It contains fibre which is good for the digestive system. 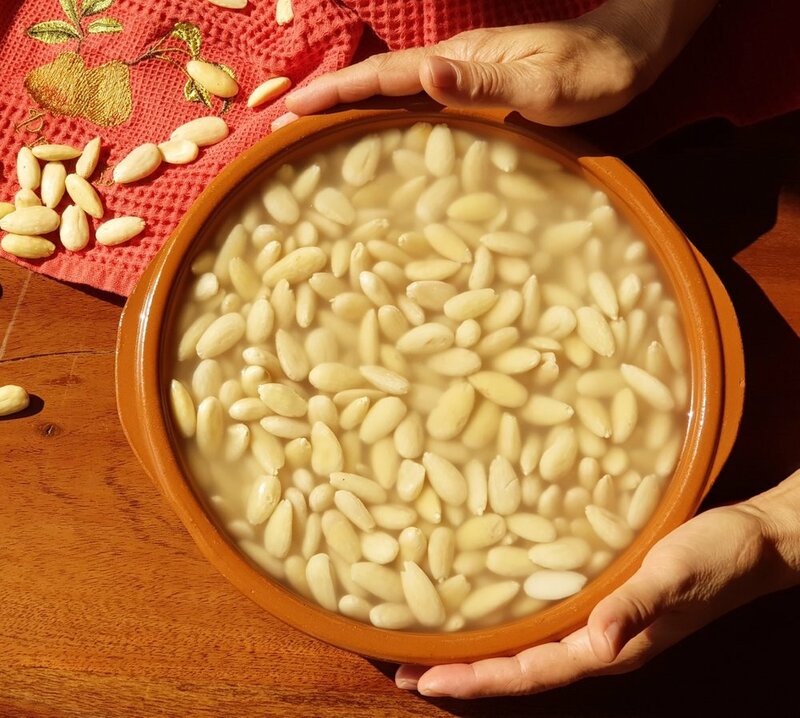 Place the almonds in a bowl and ensure they are completely submerged in warm water. Check on them every now and then to ensure they remain covered. The almonds will start to absorb some water and swell. They must be under water for at least 12 hours. I generally leave them overnight. Drain the almonds and put in a strong blender with 6 cups of warm water and blend until the almonds have creamed up. You can drain the mixture through a very fine sieve but I prefer to use a cheese cloth. Hang it from a kitchen cupboard handle until all the milk has come through. If you prefer sweetened almond milk, just add sugar, vanilla or any other plant based sugars. The pulp can freeze nicely so do not discard it. Alternatively you can store it in the fridge and use it within 3 days.  Use the pulp in smoothies, or as an alternative to flour in cakes.  Prepare your vegan cream cheese spread using the pulp by adding some salt, fresh herbs, garlic powder and onion powder.  Substitute cream from animal sources with almond milk in your cooking. If you add an acid to it, almond milk will thicken beautifully. I like to use white wine. per Serving: 2945 Calories; 261g Fat (74.4% calories from fat); 100g Protein; 102g Carbohydrate; 54g Dietary Fibre; 0mg Cholesterol; 55mg Sodium.